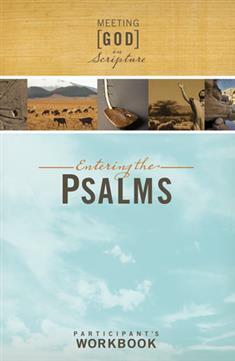 Entering the Psalms Leader's Guide is also available. A 6-week study opens the door to experience the Psalms in a new way! "O taste and see that the Lord is good." This is a different Bible study from most. Entering the Psalms invites you to consider how a collection of poetic praises and laments dating from 1400 BC to 500 BC relate to your own life and experiences. Finding that connection is at the heart of formational reading, and that's the thread of the "Meeting God in Scripture" series. Praying the Psalms is praying life itself: the highs, the lows, the doubts, the fears. Through the Psalms we're taught to "hide nothing from God but to bring all that is real into the only relationship that can bless the best and heal the worst in us. àWhen we pray the Psalms, we find new dimensions in our relationship with God. The Psalms are a sanctuary of prayer to which we may daily retreat and find nourishment for our hearts." These categories give a glimpse of how the Psalms express the relationship between God and God's people to form and transform the community of faith. As with the other titles in the series, each guided daily reading is a quick half-page read and cleanly designed for journaling.